In 2009, Wayne and Kim Owczarzak joined the hundreds of Mr. Handyman franchisees to start their very own Mr. Handyman business. 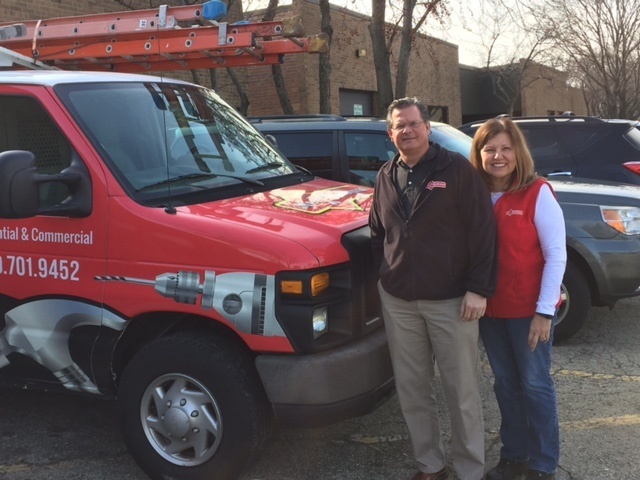 The Chicago suburbs couple has experienced their share of challenges and successes, and has used their company, Mr. Handyman of Wheaton-Hinsdale, to touch the lives of those within their business and in their neighborhood. Every business faces bumps in the road, but with dedication and hard work, those bumps can be overcome and your business may be better for it. “The challenges change with time,” Wayne explained. “At first, our biggest challenge was getting the phone to ring. Then it was finding the right technicians for our business. Now it is keeping our techs busy in the winter months, which is our slow time. Overall, it is just keeping all the aspects of the business running properly and continuing to improve and grow.” Wayne and Kim are doing just that, operating their business which now has multiple trucks and a full staff. For the Owczarzaks, going into business was a careful decision. “If you have a solid plan of where you want to be in five or ten years, but know you need a little help in getting there, then a franchise has the missing pieces to your puzzle and can help you realize your dream,” Wayne advised.